On March 24, 1993 South Africa President F. W. De Klerk announced to a joint session of parliament that South Africa had developed and manufactured nuclear weapons. South Africa is the only nation to have successfully developed nuclear weapons, and then voluntarily relinquish that capability. In his 24 March 1993 speech, Pres. De Klerk not only announced that South Africa had produced nuclear weapons, but that she had destroyed their arsenal before 10 July 1991, when South Africa joined the NPT. Indeed - it appears that not only have the weapons themselves been destroyed, and the fissile material recast into non-weapon ingots, but all design and production information has been destroyed as well. The South African program began in the mid-1970s, after large scale intervention in central and southern Africa by the Cuban military began. The apparent motivation was as a hedge against Soviet-sponsored aggression. The strategy was to use these weapons as leverage with Western powers - demonstrating their existence, and then threatening to resort to nuclear attack if assistance was not provided. The decision to abandon its nuclear arsenal was motivated by the end of Cold War intervention, and the prospect of reintegrating with the world if and when Apartheid was abandoned. The decision to completely destroy weapons related technology and information may have been made in part to keep nuclear weapons out of the hands any future black-lead government. The center of South Africa's program was the Pelindaba Nuclear Research Center, 25 km west of Pretoria, operated by the South African Atomic Energy Commission. After South Africa joined the NPT in 1991, International Atomic Energy Agency (IAEA) inspectors found an inventory of 400 kg of weapon-grade enriched uranium at Pelindaba. Suspicion immediately arose that this material had been previously used in nuclear weapons, confirmed three years later by De Klerk. South Africa developed a unique technology for enriching U-235 called UCOR during the 1960s and 70s based on aerodynamic forces produced by vortex tubes. Research on weapons began in 1971, and in 1974 the decision was made to develop and manufacture nuclear weapons. The design adopted was a gun-assembly bomb using U-235. The enrichment plant, called the the "Y Plant" was built at Valindaba, next to the Pelindaba Research Center. It had an effective capacity of around 60 kg of 90% U-235 a year, 120 kg/yr by design (12,000-24,000 separative work units or SWUs, assuming 0.3% tails assay), and was shut down in Feb. 1990. Part of this capacity was used for low enriched uranium for the two reactors of the Koeberg power plant (capacity 1930 MW electrical), and to supply 45% enriched material to the Safari 1 experimental reactor. The enrichment plant was commissioned in 1974, began producing highly enriched uranium in 1978, and by September 1979 had made enough 80% U-235 (55 kg) for Melba. It had initial production problems, and was closed from 8/79 to 7/81, but operated successfully thereafter. The total production of enriched uranium (above 80%) was 400 kg, it is believed that about 150-200 kg of 45% enriched uranium exists. The equipment for the final stages of separation was subsequently dismantled. Some uncertainty surrounds the fate of the first nuclear device built by South Africa. The story originally circulated by the South African government was that the first batch of enriched uranium (55 kg of 80% enriched U-235) was ready in September 1979 and was loaded into an experimental device named "Melba", which was completed in 1980. This device was used in one zero-yield test, the only nuclear test of the entire program. This story is now known definitely to be false in at least some important ways. In April 1997 South African Deputy Foreign Minister Aziz Pahad admitted that an unexplained nuclear explosion detected in the Indian Ocean on 22 September 1979 was a South African nuclear test, making South Africa the seventh nation known to have exploded a nuclear device. In light of this, it would seem that the first batch was indeed ready in September 1979, but was instead quickly loaded into a bomb prototype and then exploded in a covert naval operation. Whether Melba was loaded with material from later production runs, or whether Melba ever actually existed at all as a laboratory test system is an open question. The first "deliverable" device ("it could be kicked out he back of a plane"), and the second device built, was ready in April 1982. This was considered a "pre-qualification device". The final weapon design was a 65 cm by 1.8 m air-deliverable bomb weighing about 1000 kg. It used 55 kg of 90% enriched U-235 and had an estimated yield of 10-18 Kt (this is 1.0-1.8% efficient). This implies a very conservative and reliable, but inefficient, design. It used tungsten as a reflector. If it were loaded with 80% U-235, this would have been 5-9 Kt. This weapon had stringent safety and reliability standards, and a large proportion of the program's effort went into this aspect. The first was built in August 1987, and was the first truly weaponized device made. Only four devices of this type were built. When the program was terminated in 1990, a seventh was under construction (non-nuclear components only). This is really a deliverable inventory of only 4-5 bombs. The design and construction of bombs was initially undertaken by Pelindaba. This is Building 5000, which sits in a valley on the southwestern portion of the Pelindaba site, away from the main complex. 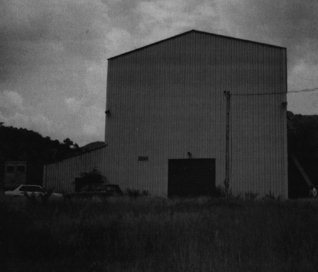 Building 5000, now abandoned and empty, was the critical assembly facility, where the first experimental weapon designs were assembled and where the Melba device was given its "zero-yield" test. Later, in 1979, bomb program management was taken over by the national armament company Armscor, now privatized and called Denel. The development and manufacture of deliverable weapons was conducted at the Advena Central Laboratory (originally called the Kentron Circle facility), 15 km east of the Pelindaba facility. Below are the lockers used for storing the actual assembled weapons at the Advena Central Laboratory. In the early 1980s, the program employed about 100 people, of which only about 40 were directly involved in the weapons program and only about 20 actually built the devices. The rest were involved in administrative support and security. By the time the program was canceled in 1989, the work force had risen to 300, with about half directly involved in weapons work. By the end of the program they could produce two to three weapons a year. At that point, the annual operating expenditures were about 20-25 million rand, or about $5.9-7.4 million at today's exchange rate. In the early 1980s, the annual budget was about 10 million rand, or about $2.9 million. The facilities and level of technology available at Advena appear much more sophisticated than a gun-type design would require. By the end of the program South Africa was investigating implosion designs, starting in the mid 80s. They considered a cost of a cold implosion test facility (natural uranium core, no nuclear reaction) to be essential for proving the implosion design. It was estimated at $3.5 million and was never built. Implosion designs would have halved the amount of material needed per bomb, and thus doubled their arsenal, while increasing the yield. Advena had also investigated using tritium to boost its existing weapons, but no plans to do so were ever approved. The yield would have been increased to 100 Kt (10% efficiency). Since it now offers custom explosive lens products for commercial and military use, it is apparent that South Africa has mastered the necessary technologies for producing efficient implosion bombs.